Confetti falls from the rafters as the Detroit Pistons beat the Los Angeles Lakers 100 to 87 in game 5 of the NBA Finals at the Palace of Auburn Hills. Photographed Tuesday, June 15, 2004. 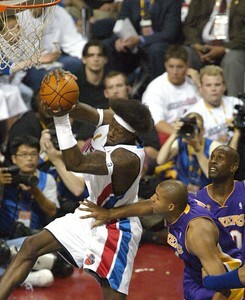 Detroit Pistons Rip Hamilton drives past Los Angeles Lakers Devean George during third quarter action in Game 5 of the NBA Finals at The Palace in Auburn Hills, Tuesday June 15, 2004. Detroit Pistons Chauncey Billups celebrates with his teammates and Pistons President Joe Dumars (with cigar) with the NBA Championship trophy after the Pistons beat the Los Angeles Lakers 100-87 in Game 5 of the NBA Finals at The Palace in Auburn Hills, Tuesday June 15, 2004. 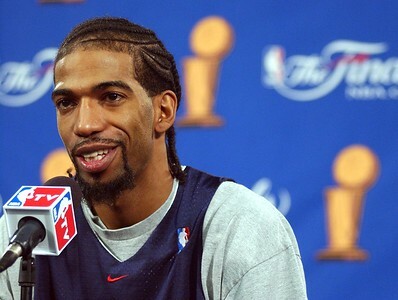 The Pistons won the series 4-1. Detroit Pistons guard Richard Hamilton drives to the basket past Los Angeles Lakers guard Kareem Rush during second quarter action in Game 5 of the NBA finals, Tuesday, June 15, 2004, at the Palace in Auburn Hills, Mich.
Los Angeles Lakers Kobe Bryant leaves the floor near the end of Game 5 of the NBA Finals as head coach Phil Jackson looks on at The Palace in Auburn Hills, Tuesday June 15, 2004. 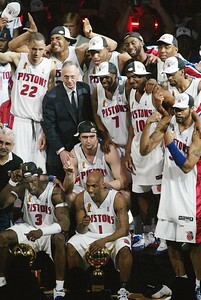 Bryant scored 24 points but the Pistons won 100-87 to win the NBA Championship series 4-1. 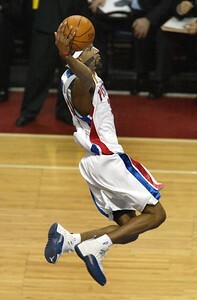 Detroit Pistons' forward slams one in during second quarter action of game 5 of the NBA Finals at the Palace of Auburn Hills as Lakers' Brian Cook watches from below. Photographed Tuesday, June 15, 2004. 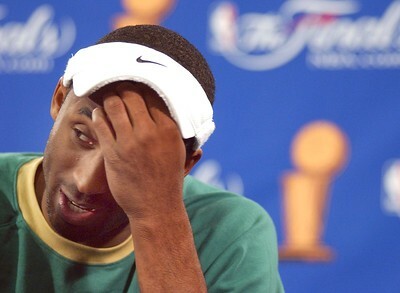 Los Angeles Lakes superstar Koby Bryant pauses as he tries to answer a question about losing on Tuesday night to the Detroit Piston during a news conference at the Palace in Auburn Hills, Mich. 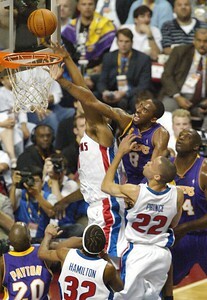 The Pistons lead the Lakers 3-1 in the series and could win the NBA Championship on Tuesday June 15, 2004. 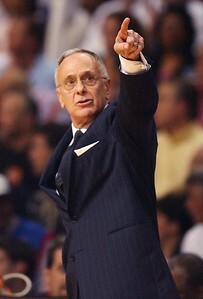 Detroit Pistons' head coach Larry Brown gestures during second quarter action of game 5 of the NBA Finals at the Palace of Auburn Hills. Photographed Tuesday, June 15, 2004. 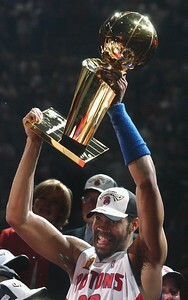 Detroit Pistons Rasheed Wallace hoists the NBA Championship trophy after the Pistons beat the Los Angeles Lakers 100-87 in Game 5 of the NBA Finals at The Palace in Auburn Hills, Tuesday June 15, 2004. 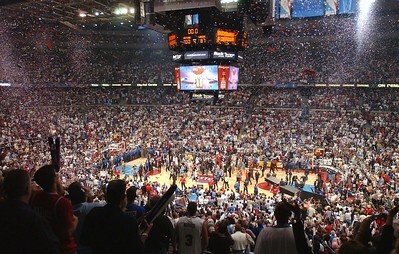 The Pistons won the series 4-1. 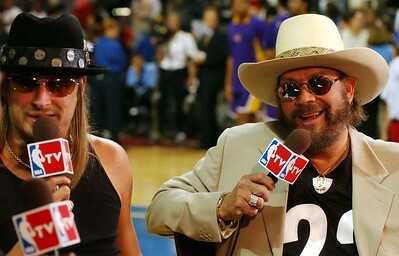 Kid Rock, left, and Hank Williams Jr. share their thoughts during pregame before the start of the game between the Detroit Pistons and the Los Angeles Lakers in Game 5 of the NBA finals, Tuesday, June 15, 2004, at the Palace in Auburn Hills, Mich.
Detroit Piston player Richard Hamilton answers a reporters question during a media press conference after practice as they prepair a for game 5 against the Los Angeles Lakers at the Palace in Auburn Hills, MI. 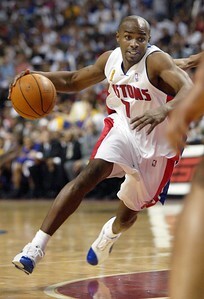 The Pistons lead the Lakers 3-1 in the series and could win the NBA Championship on Tuesday June 15, 2004. 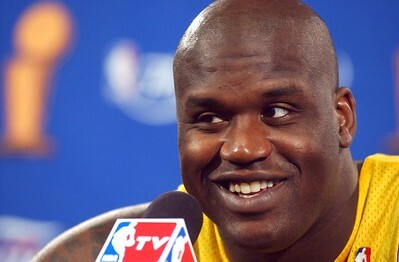 Loa Angeles Lakes player Shaquille O'Neal answers a reporters question during a media press conference after practice as they prepair a for game 5 against the Detroit Pistons at the Palace in Auburn Hills, MI. 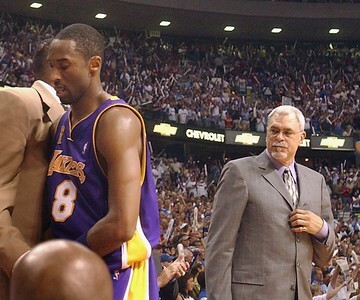 The Pistons lead the Lakers 3-1 in the series and could win the NBA Championship on Tuesday June 15, 2004. The Lakers are nowhere to be found as Detroit Pistons' guard Richard Hamilton slam dunks one in during second quarter action of game 5 of the NBA Finals at the Palace of Auburn Hills. Photographed Tuesday, June 15, 2004. Los Angeles Lakers center Shaquille O'Neal, right, grabs the rebound over Detroit Pistons center Ben Wallace during first quarter action in Game 5 of the NBA finals, Tuesday, June 15, 2004, at the Palace in Auburn Hills, Mich.
Los Angeles Lakers' guard Kobe Bryant passes during first quarter action of game 5 of the NBA Finals at the Palace of Auburn Hills. 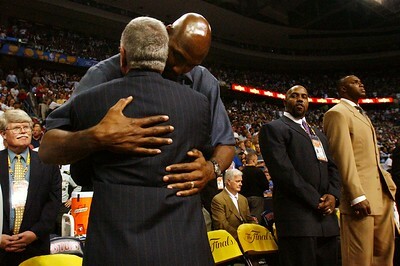 Photographed Tuesday, June 15, 2004. 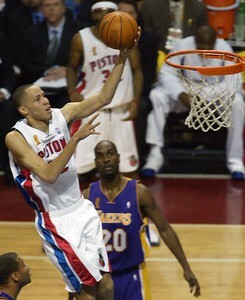 Detroit Pistons' forward Tayshaun Prince lays one up during first quarter action of game 5 of the NBA Finals at the Palace of Auburn Hills. Photographed Tuesday, June 15, 2004. Detroit Pistons Rasheed Wallace shoots over Los Angeles Lakers Devean George during first quarter action in Game 5 of the NBA Finals at The Palace in Auburn Hills, Tuesday June 15, 2004. 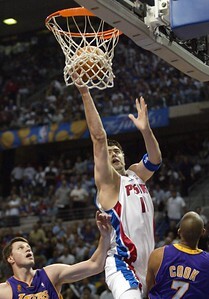 Detroit Pistons' Mehmet Okur breaks through Los Angeles Lakers' Stanislav Medvedenko and Brian Cook during second quarter action of game 5 of the NBA Finals at the Palace of Auburn Hills. Photographed Tuesday, June 15, 2004. Detroit Pistons Chauncey Billups celebrates after being named MVP of the NBA Finals after the Pistons beat the Los Angeles Lakers 100-87 at The Palace in Auburn Hills, Tuesday June 15, 2004. The Pistons won the series 4-1. Los Angeles Lakers' guard Kobe Bryant puts one up during first quarter action of game 5 of the NBA Finals at the Palace of Auburn Hills. Photographed Tuesday, June 15, 2004. Detroit Pistons celebrate after defeating the Los Angeles Lakers in game 5 of the NBA Finals 100 to 87 at the Palace of Auburn Hills. Photographed Tuesday, June 15, 2004. 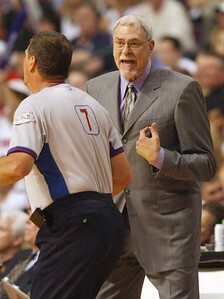 Los Angeles Lakers' head coach Phil Jackson argues with an offial during second quarter action of game 5 of the NBA Finals at the Palace of Auburn Hills. Photographed Tuesday, June 15, 2004. Detroit Pistons Tayshaun Prince gets helped up after a hard foul during first quarter against Los Angeles Lakers during action in Game 5 of the NBA Finals at The Palace in Auburn Hills, Tuesday June 15, 2004. 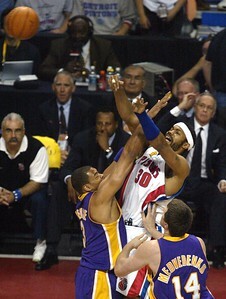 Detroit Pistons' forward Rasheed Wallace shoots over Los Angeles Lakers' Devean George during first quarter action of game 5 of the NBA Finals at the Palace of Auburn Hills. Photographed Tuesday, June 15, 2004. 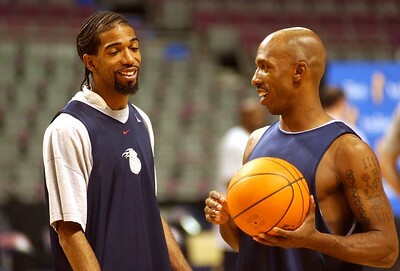 Detroit Piston players Richard Hamilton,left, and Chauncey Billups chat and during practice as they prepair a for game 5 against the Los Angeles Lakers at the Palace in Auburn Hills, MI. 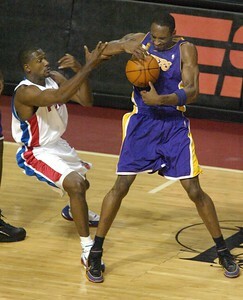 The Pistons lead the Lakers 3-1 in the series and could win the NBA Championship on Tuesday June 15, 2004. Detroit Pistons' guard Richard Hamilton rears back during second quarter action of game 5 of the NBA Finals at the Palace of Auburn Hills. Photographed Tuesday, June 15, 2004. 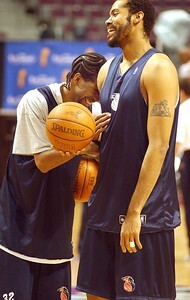 Detroit Piston players Richard Hamilton and Ben Wallace joke around during practice as they prepair a for game 5 against the Los Angeles Lakers at the Palace in Auburn Hills, MI. 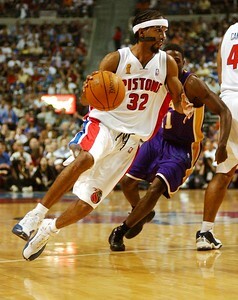 The Pistons lead the Lakers 3-1 in the series and could win the NBA Championship on Tuesday June 15, 2004. 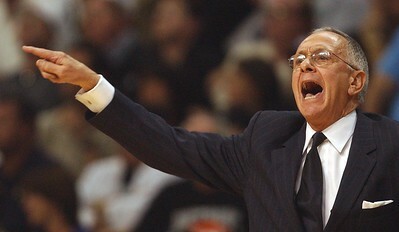 Detroit Pistons head coach Larry Brown barks instructions to his team during first quarter action against the Los Angeles Lakers in Game 5 of the NBA Finals at The Palace in Auburn Hills, Tuesday June 15, 2004. 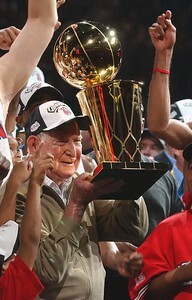 Detroit Pistons owner Bill Davidson hoists the NBA Championship trophy after the Pistons beat the Los Angeles Lakers 100-87 at The Palace in Auburn Hills, Tuesday June 15, 2004. The Pistons won the series 4-1. 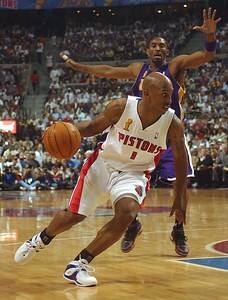 Detroit Pistons Chauncey Billups drives past Los Angeles Lakers Kobe Bryant during first quarter action in Game 5 of the NBA Finals at The Palace in Auburn Hills, Tuesday June 15, 2004. Detroit Pistons' guard Lindsey Hunter fights for a loose ball with Los Angeles Lakers' guard Kobe Bryant during second quarter action of game 5 of the NBA Finals at the Palace of Auburn Hills. Photographed Tuesday, June 15, 2004. Detroit Pistons' Tayshaun Prince and Richard Hamilton embrace as time begins to run out on the Los Angeles Lakers during second quarter action of game 5 of the NBA Finals at the Palace of Auburn Hills. Photographed Tuesday, June 15, 2004. 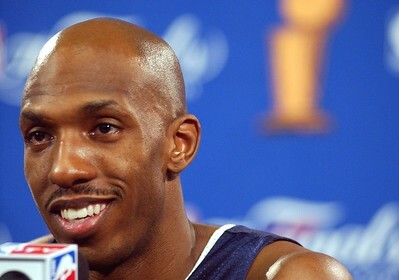 Detroit Piston player Chauncey Billups smiles as he answers a reporters question during a media press conference after practice as they prepair a for game 5 against the Los Angeles Lakers at the Palace in Auburn Hills, MI. 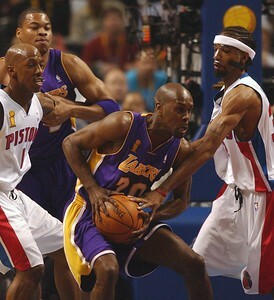 The Pistons lead the Lakers 3-1 in the series and could win the NBA Championship on Tuesday June 15, 2004. 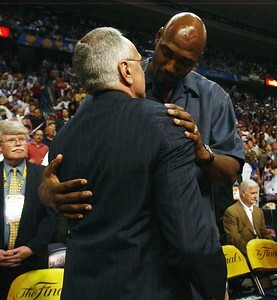 Los Angeles Lakers forward Karl Malone, facing camera, hugs Detroit Pistons head coach Larry Brown during pregame before the start of the game between the Detroit Pistons and the Los Angeles Lakers in Game 5 of the NBA finals, Tuesday, June 15, 2004, at the Palace in Auburn Hills, Mich.
Detroit Pistons Corliss Williamson tries to keep position against Los Angeles Lakers Shaquill O'Neal during first quarter action in Game 5 of the NBA Finals at The Palace in Auburn Hills, Tuesday June 15, 2004. Detroit Pistons Tayshaun Prince keeps an eye on Los Angeles Lakers Kobe Bryant during first quarter action in Game 5 of the NBA Finals at The Palace in Auburn Hills, Tuesday June 15, 2004. Detroit Pistons Chauncey Billups (1) and Rip Hamilton defends against Los Angeles Lakers Gary Payton as teammate Devean George looks on during first quarter action in Game 5 of the NBA Finals at The Palace in Auburn Hills, Tuesday June 15, 2004. 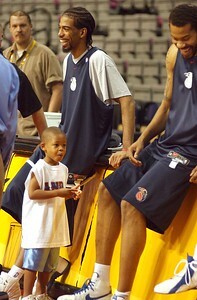 Dominic Ham, 4, son of Detroit Piston player Darvin Ham chat with Detroit Piston Players Richard and Rasheed Wallace during practice as they prepair a for game 5 against the Los Angeles Lakers at the Palace in Auburn Hills, MI. 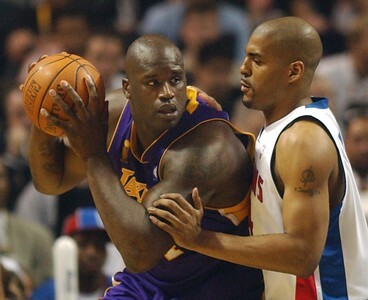 The Pistons lead the Lakers 3-1 in the series and could win the NBA Championship on Tuesday June 15, 2004. Detroit Pistons' center Ben Wallace sinks one in as Los Angeles Lakers' Brian Cook watches during second quarter action of game 5 of the NBA Finals at the Palace of Auburn Hills. Photographed Tuesday, June 15, 2004. Detroit Pistons' forward Mike James drives towards the basket during second quarter action of game 5 of the NBA Finals at the Palace of Auburn Hills. Photographed Tuesday, June 15, 2004. 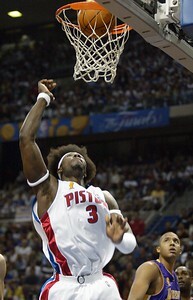 Detroit Pistons' center Ben Wallace strips one down from Los Angeles during first quarter action of game 5 of the NBA Finals at the Palace of Auburn Hills. Photographed Tuesday, June 15, 2004. Detroit Piston head coach Larry Brown horse plays with Donovan Ham,7, son of Detroit Piston player Darvin Ham during practice as they prepair a for game 5 against the Los Angeles Lakers at the Palace in Auburn Hills, MI. 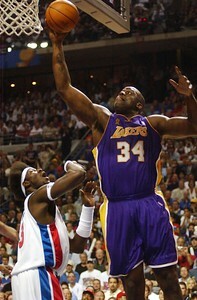 The Pistons lead the Lakers 3-1 in the series and could win the NBA Championship on Tuesday June 15, 2004.